Villa Roses is peacefully located in Icici, 280 meters from the beach and the center. It features a spa including a pool, barbecue facilities and panoramic sea views from all apartments. 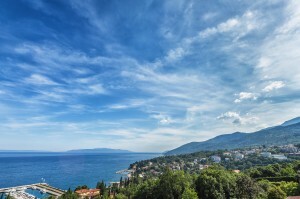 The center of Opatija with its large parks and elegant villas can be reached within 3 km. All elegantly furnished apartments are air conditioned and have a kitchen or a kitchenette, a balcony and are equipped with a sitting area and a work desk. Guests have free access to Wi-Fi in every apartment. For each apartment there is a place with deck chairs and sun umbrellas reserved on the terrace, where you can enjoy the sun and the view of the sea. Spa facilities include an pool with a counter-current facility, a jacuzzi, an infrared sauna, a Finnish sauna, and a Turkish bath. The spa area has a convertible roof – the swimming pool and jacuzzi can be outdoor as well as indoor. The pool is accessible free of charge. We offer shuttles from Rijeka (Krk) Airport and Pula Airport.